I recently wrote Jason Ross, the author of www.drivemomcrazy.com, a site where Jason reflects on his experience as a person on the spectrum. I asked Jason if he would write about how he experiences and copes with anxiety in his daily life. I asked for specific skills that seem to work to reduce anxiety. “I received a request for this post from one of my readers who had emailed me. Anxiety is one of the biggest factors which can impair any Autistic person from functioning with the rest of society. A lot of times anxiety can lead to meltdowns, tantrums, aggression, sensory/emotional overload, or even shutdown depending on where the root of the anxiety originally started. Anxiety overwhelms us differently. Some people feel more overwhelmed by the anxiety than others or some people just know how to cope better with the anxiety. There are 2 factors to anxiety: nervous feelings that can control/prevent a person from functioning which can lead to depression. It affects us, Autistic people differently than every one else. In order to function better in society, Autistic people (whether diagnosed with Autistic disorder, PDD-NOS, or Asperger’s Syndrome) need to learn the best way to cope in order to function with the rest of the world. I am learning how to meditate in order to control my anxiety. However a lot of times I find when spinning around (especially when I was younger), closing my door to my room to rub my body against the carpet (especially when I was younger), clapping my hands incessantly, walking outside to hug trees, and/or vocalizing my thoughts mostly in the shower as I feel the warm water beating on my body help me with anxiety. A lot of times when I vocalize my thoughts, many people have felt I am talking to them so they answer me. However, I am just sorting through my thoughts on ideas or issues I am having in my life. Although in recent years, I am slowly learning to quiet my mind in a meditative state. I started reading books on meditation and learning by myself to have my own mantra (to be able to focus one thing). A lot of times I revert back to my natural ways of coping with anxiety because it’s easier to use up the energy of the anxiety. This only removes the anxiety temporarily without focusing on confronting what I need to deal with. Meditation has been my inner strength in times of anxiety these days. I find meditation soothes my body as I breathe deep and slowly. I also find that meditation allows me to observe more. Though, through my entire life I noticed I would observe the world differently by seeing the way the shadows from trees, animals, and other things in my environment like the sun affect us. Now meditation often changes my observations by allowing me to observe my whole environment including other people. I feel if many other Autistic people regardless of where they fall on the autism spectrum can learn to focus their breathing and thoughts on one thing through meditation, they will be able to start coping with anxiety a lot better. Meditation is a great resource, but can’t help every one not even the so-called Neurotypical people. For instance, some Autistic people are in self-stimulation (stimming) mode many times throughout the day, that their brains won’t function in a calm way unless they are doing their special interest. However every one must try to do meditation anyway to see if it works too. One time I met a person last year who clearly had autistic disorder with intellectual disability and he clearly couldn’t function without being drawn to YouTube. The parents send him to a camp a few hours away where they live so he can live at that camp all year long. I brought the parents and the son to the Apple store to look at the Ipad for their son. I feel the Ipad would help their son only if therapists can help their son use it to engage with the rest of society. Is it that important for every one to engage in society? What if some people just want to be with the rest of nature? I have noticed some Autistic people don’t want to engage with other people. Is this because the anxiety overwhelms them so much that no body taught them how to cope with it? It’s easier to cope with the anxiety than to leave yourself isolated and lonely. Loneliness is not only an Human problem, it’s a non-Human problem as well. Many dogs, cats, and other animals get lonely even rodents. Have you noticed plants can get lonely? In fact, have you ever thought all five kingdoms of the many organisms of life can become lonely. The point is any one who is a part of the animal kingdom needs to cope with anxiety in order to function with the rest of the animal kingdom. Some people who can’t function with other people, need to just realize who they are to function with every one else to feel connected to another Human being. Some people can only function with other people because they are afraid of other animals. It’s very important to cope with the anxiety to function with all positive life forms. That’s where meditation and non-judgmental thoughts help out. For example, when a fly lands on your arm for a just a moment, its there for just a moment to interact with you. We not only need to accept Neurodiversity, we need to accept Biodiversity to be able to cope with the anxiety of being around others. The best way to cope with anxiety is accepting to connect with others. By doing so, we need to accept who we are and know what works best for us. For me, I am learning to meditate to calm my mind. Give it try yourself! If you can’t cope with the anxiety doing that try to listen to positive song tunes in your head like “I Believe I can Fly” by R.Kelly or hold a small rock in your hand or use a cloth tissue to hold on to. In the end, you can get through it if you believe. To me, engagement in play means, really getting the child to be present and in the room with you. I have yet to find a better way to connect with a child than play. Play is the way children communicate. It is the way they connect and engage with their inner and outer world. Rumi, the ancient Afghan poet once wrote, “When your with children, talk about toys. From playthings, little by little they reach into deeper wisdom and clarity. Gradually they lose interest in their toys”. When working with a young child on the spectrum, specifically a largely non-verbal or withdrawn child, reciprocal play cannot be beat. Stanley Greenspan and Serena Wieder’s DIR-Floortime model describe this approach beautifully in their book, “Engaging Autism: Using the Floortime Approach to Help Children Relate, Communicate, and Think”. Reciprocal play focuses on engaging the child in child-directed play. This type of play does something Greenspan and Wieder call “building circles of communication”. Essentially, in doing this the caregiver is keeping the child present in back-and-forth exchange for longer periods of time and in the room (not withdrawn). One fundamental component of Floortime is “obstructive play” – literally pushing your way into your child’s solitary play (putting your car on the tracks of his train set just to force interaction). A new study came out that suggests gum chewing may be associated with a reduction in anxiety, depression, and even cholesterol and blood pressure. Clinical studies are underway to further test this idea. If true, we better all start chewing gum ASAP! I recently watched the movie “Extremely Loud and Incredibly Close”. The story depicts a young teen with Aspergers. I wont get into the story line but I will say that it’s a worth-while-watch for the young actor’s portrayal of the sensory experience of those with ASD. If you do watch, try to notice the way the boy experiences sound, light, and visual information. Also, take note of his “safe space” – a small and enclosed space with familiar objects where the boy can be alone with his thoughts and his things. Every child on the spectrum should have a space at home to decompress and take a break. Warning: The movie deals with a very difficult topic, the loss of a loved one following the 911 attacks. Below is a simple chart depicting the Activity Cycle. The Activity Cycle is meant to provide caregivers with a template to reference when planning a spontaneous day off. Traditionally unplanned and/or spontaneious days off for the kids can equal terror for the caregiver (“It’s only a matter of time before…”). I recently created this cycle based on observations I and caregivers I work with have made about the behavioral patterns seen in children. CLICK ON THE PICTURE. Please read the footnotes at the bottom of the picture as they explain the terms. 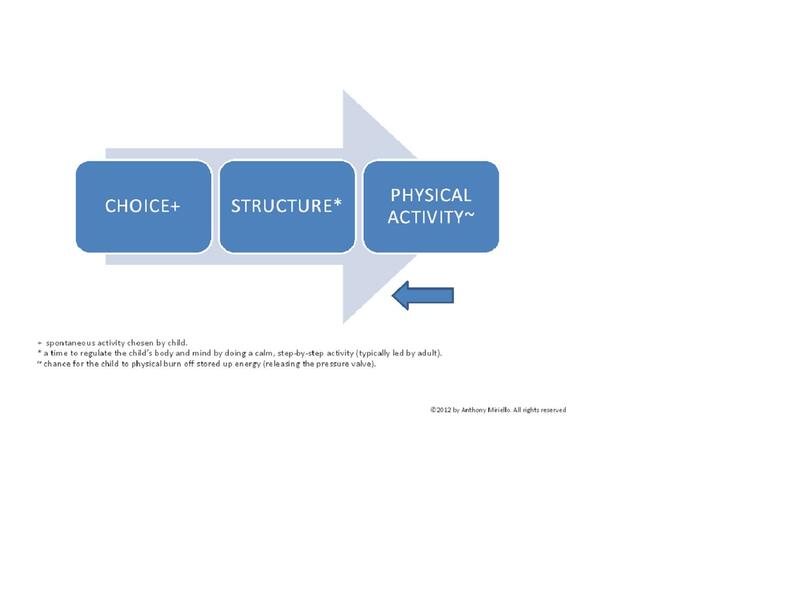 Choice: Open ended and child-centered activity. If you feel that your child needs more direction, I like to set out 3 or 4 simple stations (ex: a few trains and tracks, art table with a few paints and paper/ a scissor cutting activity, sandtray/water bucket with a few fun toys). Structured Activity Ideas: Meant to help the child regulate following free time that is often overstimulating/disregulating. Example: Sorting toys by category (animals, action figures, cars), Toy Car Wash, sifting rocks/beads out of sand tray, helping to cook a simple meal, putting together a simple puzzle, etc. Physical Activity Ideas: walking, playing at the park, horsing around/gentle wrestling, stair climbing, hiking, floor exercises, yoga, whatever gets the body moving and expending energy. – Try to always follow the physical activity with another calming, break-like activity (maybe this is an opportunity for your child to do something quiet like play with his/her card collection, read a familiar story with or without you, watch a short show, take a nap, go on the swing, etc). Stress plays a major role in the way the autistic child experiences and makes sense of the world. Imbalances in the way sight, sound, touch, and to a lesser extent smell and taste are processed (hyper/hypo sensitivity) create a sensory experience much different from that of a neurologically typical child. A life filled with sensory-processing imbalance is just one contributor to the elevated level of stress in the autistic child. Challenges in executive functioning (planning ahead), non-verbal and verbal communication deficits, stereotypical or repetitive behaviors and interests, and an abnormally high degreee of external structure/lack of autonmy in choices throughout the day come together to create a recipe for frustration, confusion, and anxiety. Elevated levels of stress have been linked to the following responses in typically developing adults: acceleration of heart rate and lung action, paling or flushing, inhibition of stomach and upper-intestinal action, constriction of blood vessels, dilation of pupil, auditory exclusion (loss of hearing),tunnel vision (loss of peripheral vision), shaking, anger, argumentative behavior, social withdrawal, substance abuse, increased solitary activity (television viewing, computer time, etc.) – just to name a few*. It is my belief that children with autism live in a chronic state of stress, with too few periods of recovery throughout the day. If we begin to look at stress reduction models and interventions, we may find that we can significantly improve the quality of the autistic child’s daily experience. It is my intention in today’s post to bring this concept of stress and its relation to the autism community to the reader’s attention. I would encourage the reader to access the wonderful and free site, http://www.ncbi.nlm.nih.gov/pubmed/, to begin researching peer-reviewed journal articles on stress and autism. Please share in a post or email (amiriello@gm.slc.edu) if you find one of interest. *(Scientific explanation of stress response http://www.fi.edu/learn/brain/stress.html#how). Eli is jumping off the walls. He’s running circles in the house, knocking things over with no awareness of his body in space. You know he’s unwound, dis-regulated, hyper-aroused, overstimulated and all the other words we use to describe a child who is not in control. You try to STOP him, calm him, settle him down. But his body is at a 10 and you’re asking for it to shift to a 1. It’s time for a rhythm building exercise which matches his level (10) and slowly brings him down (2,3,4,5ish). The following activities are great for helping your child regain a sense of control over his or her body and return to a more regulated state. – Start doing this hand-in-hand at the child’s pace to a count (1,2,3,4…). Your child is releasing energy (body tension) with a rhythmic, repetitive exercise that allows him to gradually slow his body down. It gets him both active and regulated and is practical (stairs can be found anywhere). Not to mention, he may begin to gain some awareness around his own body rhythm and eventually use these exercises independently. – Start by facing one another hand-in-hand and rocking back and forth at your child’s current rhythm. Gradually bring the rhythm down to a place that you feel is more regulated. -This is fun to do with a metronome (free IPHONE app www.marketwall.com). The metronome can start at a fast pace and slowly make its way to a crawl. 3) Swinging is a great way (hammock, in the back yard, at the park) to regain a more calm body rhythm. Counting is always helpful because it gives the child a verbal idea of their current rhythm (“Lets see if we can slow you down”). There are a million more rhythm building exercise (jogging, spinning to a count, walking, dancing, singing…Neil Young’s “Old Man” especially, etc) . I advise parents to implement these semi-structured rhythm building exercises into the daily schedule. They are beneficial both from a fitness standpoint as well as being a proactive measure for helping your child alleviate built up tension that accumulates throughout the day. 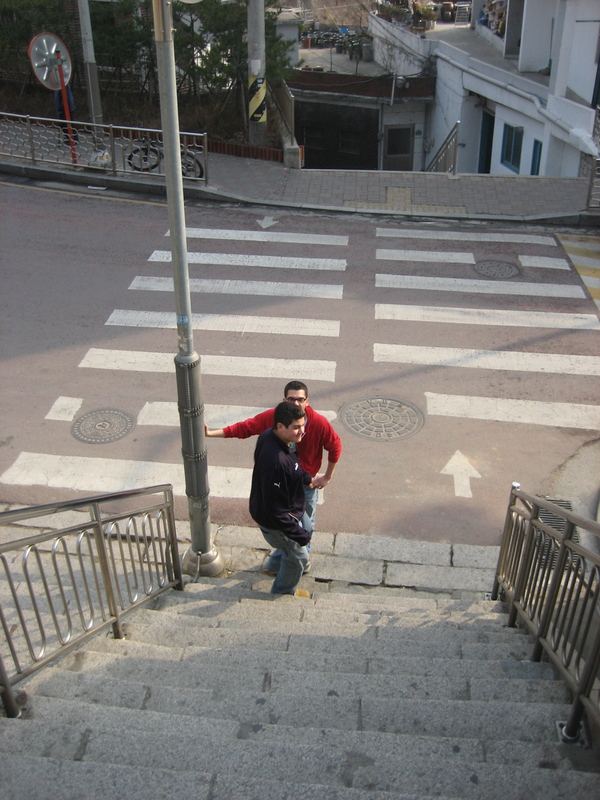 Picture: My brother Doug and I stair climbing in Korea.